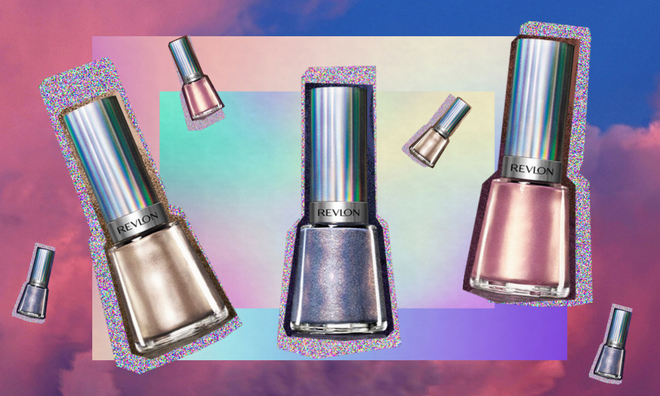 If the internet’s obsession with last week’s glitter sunscreen is anything to go by – not to mention, almost all of Coachella’s best looks – the sparkly, holographic trend isn’t going anywhere for now. And Revlon are here for it, huni. Beautiful minty-green ‘Fairy Dust’ (so reminds us of our childhood Sky Dancers), golden baby pink ‘Blushing’, crystal-inspired ‘Amethyst Smoke’, classic champagne gold ‘Gilded Goddess’, purpley night-sky ‘Unicornicopia’, space-like silver ‘Molten Magic’, pure holographic ‘Hologasm’, and cool fuchsia ‘Galactic Pink’ – you’re gonna want them all. Get them at your local pharmacy, or shop online at Takelot or Zando. Each bottle sells for a recommended retail price of R119 – perfect as a weekend spoil. The best part? Revlon are part of the Responsible Micah Initiative, meaning you can enjoy all that glitters guilt-free. Find out more through Revlon South Africa’s Facebook page. The colours are absolutely stunning. Wow these colours are phenomenal!!! And of a great quality. I love all Revlon products. And their nail polish are good quality and not too pricey! I love anything that glitters, shimmers or shines. I am definitely giving this a try! Love these new nail varnish colors from Revlon!! I am a big fan of nail enamel and constantly seeking new colors. I would realy love to test this out!